Ask most women how they feel about their hair and they’ll most likely tell you about how important it is to them — it is, after all, a reflection of their identity. Men may not say it as often, or care as much about long, silky curls, but their hair is just as much a reflection of their identity too. So losing it can be devastating. So devastating that 62 percent of men involved in a 2005 European study said hair loss would affect their self-esteem, with the biggest concern being they’d lose whatever attractiveness they had. 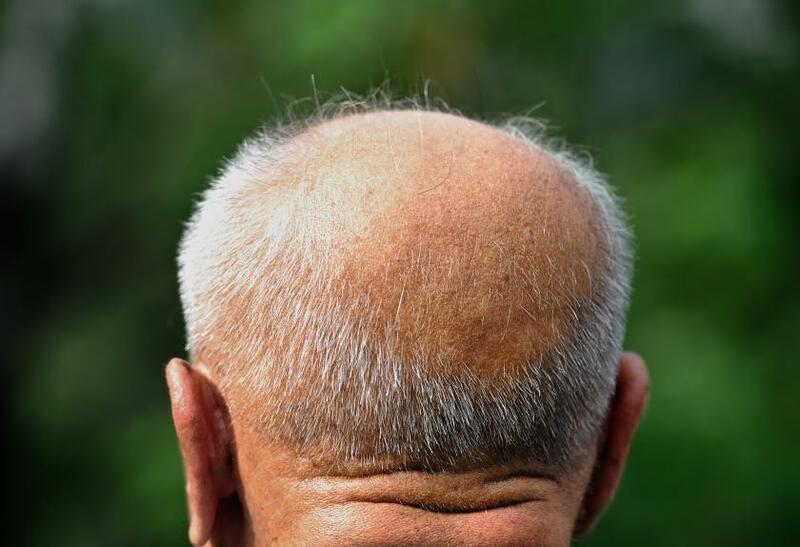 Unfortunately, hair loss, and eventual baldness, is far more common in men than women. But why? Both men and women can experience hair loss, the most common of which is called male or female pattern baldness, or androgenetic alopecia. Hair loss is much different than hair shedding (telogen effluvium) too, which can occur in just about everyone at some point or another when the body goes through something traumatic, such as a stressful event. Eventually the hair will grow back, though. With hair loss, this isn’t the case; it’s permanent, affecting as many as 70 percent of men and 40 percent of women in their lifetimes. For this reason, we’ll focus on androgenetic alopecia. You may have gotten some idea of the cause from its name. Though there are a variety of environmental factors that may also play into a person’s risk, androgenetic alopecia is widely believed to be a genetically inherited condition as it “tends to cluster in families,” according to the National Institutes of Health (NIH). Specifically, variations in the so-called AR gene may increase activity of androgen receptors in the hair follicles, which respond to androgens like dihydrotestosterone (DHT), a byproduct of testosterone. DHT shrinks hair follicles though, making it difficult for healthy hair to live. And because it’s constantly being made in testosterone-filled men, it’s far more likely to affect them than women. Because all of our hormones are raging during puberty, androgenetic alopecia can begin as early as a person’s teens, and risk increases with age. By age 35, approximately two-thirds of men will have lost at least a little hair, and by 50, about 85 percent have said goodbye or experienced hair thinning, according to the American Hair Loss Association. In women, the condition can also develop early but usually occurs after menopause — this effect isn’t caused by higher testosterone levels, but rather a sharp drop in other hormone levels. And while men typically lose their hair in a defined pattern — think a widow’s peak and a bald crown — women lose hair and experience thinning all over, although they never fully go bald. ·Avoid inflaming the hair follicles. While cornrows and other hairstyles that pull the hair tight may look good, they can inflame and scar the hair follicles, which ultimately kills healthy hair. In people predisposed to androgenetic alopecia, these types of hairstyles are especially risky. Incorrectly applying chemicals to the hair, such as dyes, bleaches, and straighteners can also cause damage. ·Get some FDA-approved medications. You’ve probably heard of Rogaine (minoxidil) before. While some people may not believe it works, the drug can certainly prevent hair loss, and sometimes restore hair growth too — most people just don’t know how to use it. The trick, according to Men’s Health, is to use it at least twice a day for six months. Some people may shed hair initially, but eventually it will work. Propecia, a prescription drug, blocks testosterone from turning into DHT, thus preventing hair loss. ·Change your diet. Hair needs proper nutrition to grow healthy — you are what you eat after all. Make sure there’s a good amount of iron, zinc, vitamin D, protein, omega-3 fatty acids, and biotin in your diet. Also skip out on the fatty fried foods and desserts; oil from the fried food might turn testosterone into DHT faster through heightened oil-gland activity, while the sugar from desserts increases insulin levels, triggering the release of testosterone. ·Get surgery. A few surgeries exist, but according to Men’s Health, more men are choosing one called follicular unit extraction (FUE) because it’s less invasive than other techniques. It involves grafting hair follicle groups from a donor area on the person’s scalp and then transplanting them to the balding area. “It’s a shorter, less painful recovery, and completely eliminates linear scarring along the back of the head,” Dr. Alan Bauman, a hair-loss specialist in Florida, told Men’s Health. Speaking to the Huffington Post, Bauman said 50 percent of hair loss can occur before it’s even noticeable to the human eye. This means taking preventive steps is all the more important in reducing risk of hair loss.